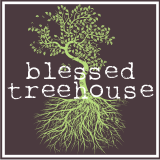 Blessed Treehouse: Santa Claus is coming . . .
. . . to scare the crap out of your kid. We had a fun night planned. Dinner, friends, kids, Christmas festivities, and one of the strangest traditions - sitting our children on a stranger's lap, a stranger who dresses in red velvet and white fur. It started out as a lovely evening. Following an enjoyable dinner, we headed over to the community center where we (the deceitful adults) expected to find a jolly Santa sitting atop an antique fire truck - the perfect setting for a Christmas picture. And we were not disappointed. Santa was jolly (see for yourself) and the fire truck was straight out of a vintage storybook. while Henry's dear friend (and future wife), the wise-beyond-her-years Kaitlyn, appeared to summon her sixth sense. Though calm, she seemed cautious. You see, Kaitlyn is no fool. She has the vocabulary of a doctoral candidate, and earlier in the week she adamantly explained to her mom, Erin, that she was not interested in seeing Santa Claus. Sure, Henry and Harper could visit him if they wanted, but Kaitlyn repeatedly said, "No!" when Erin mentioned visiting Santa. Erin thought it might be best if Henry and Harper sat on Santa's lap first, that way Kaitlyn would see how much fun it is. Harper sure thought it was fun. Henry, on the other hand . . .
. . . Henry couldn't get off that fire truck fast enough. His animal instinct kicked in full force. Forget fight OR flight, Henry demonstrated fight AND flight. And bless Santa's heart. By the time Kaitlyn was dragged up there, Santa put his hands up as if to say, "I'm just a sweet, old, unarmed guy playing dress-up." But the chaos was short-lived. Because just around the corner from the torture chamber was Mrs. Claus herself. The real Mrs. Claus. I know that she was the real deal because with her she brought dozens and dozens of delicious cookies that magically erased all memory of the previous hour. Harper remained unfazed by The Great Santa Disaster of 2009. She didn't need any goodies from the North Pole to ease her troubles. And would you believe that this picture was taken only minutes after he clawed his father trying to escape the fire truck? And it's that adorable face that made all the fuss of the evening absolutely worth it. He might not remember it, but this was one evening that I will never forget. I LOVE this post. I was totally that kid who was terrified of Santa, so I can relate to Henry and Erin. The pictures are great, and I love that you have this memory. Happy Holidays, my friend!! favorite part: "vocabulary of a doctoral candidate". you are hysterical, my friend. I love it! And you look stunning. Oh man! What fun! You do look great Ali. Kaden had that sweater vest too and it was one of my favorites! Wear it lots...I saved it and I'm sure he didn't get to wear it more than once or twice. Love that Henry and Kaitlyn are a "couple." can't wait to put those pictures in their wedding video!